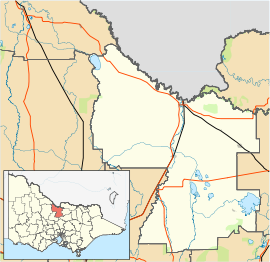 Colbinabbin /ˈkɒlbɪnæbən/ is a small town in central Victoria, Australia. The name is derived from aboriginal meaning "the meeting of the black and red soils". At the 2011 census, Colbinabbin and the surrounding area had a population of 297. Located on the banks of Cornella Creek, Colbinabbin was first settled in the 1850s. A township was established in the 1870s, the Post Office opening on 9 August 1872. In the 1930s the area had significant change with the construction of the Waranga - Mallee channel, which bisects the town. Irrigation altered land use to the north of the town and to this day has made it very productive farmland. Cereal cropping and livestock production have been important industries in the Colbinabbin area. Since the late 1960s tomatoes have been produced for processing into sauces and pastes. A local company also specialises in semi-dried tomatoes for the export market. Colbinabbin in recent years has seen a boom in wine growing and a substantial number of vineyards have been established in the area, especially along the Mount Camel Range, known colloquially as 'The hill'. The red volcanic soil of the Mount Camel Range was formed in Cambrian times and is ideal for grape production. The easterly aspect, irrigation water and warm climate have accelerated this development. Shiraz is the most common variety grown. This area forms part of the Heathcote Wine Region. Colbinabbin has an active community fielding teams in several sports including an Australian rules football team playing in the Heathcote District Football League, netball, tennis, lawn bowls and cricket sides. The Colbinabbin Football Club recently won the Senior Premiership in the Heathcote District Football League by defeating Heathcote by 22 points at the Grand Final held at Huntly. Colbinabbin has featured prominently in regional media with the construction of a pipeline connecting the Waranga-Mallee channel to Lake Eppalock and onto Ballarat. This 'superpipe' will draw water from the main channel at a location just north of the town. Local opposition to this development has been reported on ABC news and a petition against further drawing of water from the Goulburn system has been initiated. A protest on August 31 saw the Premier of Victoria, John Brumby, unable to leave the pipeline compound for seventy five minutes. This was reported widely in the media, including ABC news and The Herald Sun newspaper. Water from the Goulburn River is diverted at the Goulburn Weir and sent via the Stuart Murray and Cattanach Canals to the Waranga Basin. Approximately 91% of the flow of the Goulburn River is diverted at this point. This provides much of the water that flows along the Waranga Mallee channel that bisects the town. ^ a b Australian Bureau of Statistics (31 October 2012). "Colbinabbin (State Suburb)". 2011 Census QuickStats. Retrieved 5 December 2014. ^ "Heathcote, Victoria". Wine Regions. Australian Wine and Brandy Corporation. Retrieved 2007-08-03.